Prominent politicians and UN officials stressed the role of interreligious and intercultural dialogue for conflict prevention and post-conflict peacebuilding at the first plenary session of the 8th Global Forum of the United Nations Alliance of Civilizations (UNAOC) in New York on 19 November at the United Nations Headquarters in New York. 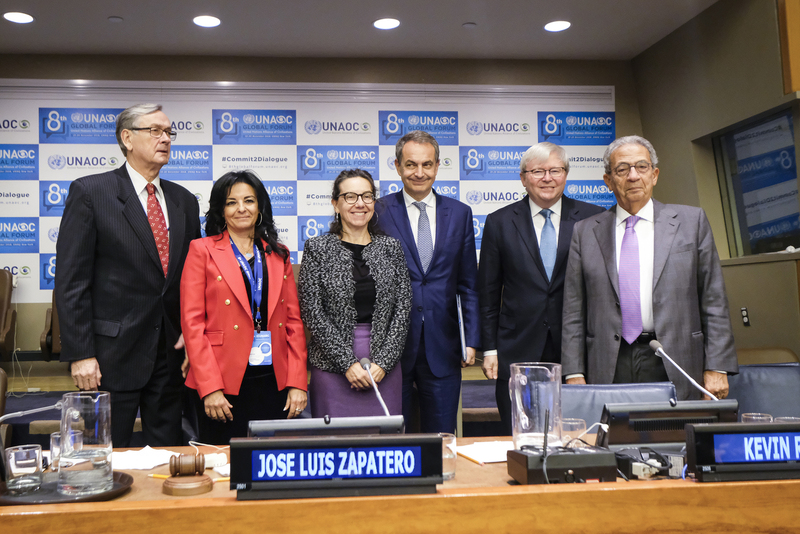 Speakers in the plenary, which was moderated by Ms. Nihal Saad, Chief of Cabinet and Spokesperson for the High Representative of UNAOC, included: H.E. Mr. José Luis Rodríguez Zapatero, Former Prime Minister of Spain; H.E. Mr. Danilo Türk, Former President of Slovenia; H.E. Mr. Kevin Rudd, Former Prime Minister of Australia; H.E. Amr Moussa, Former Secretary-General of the League of Arab States; and H.E. Mrs. Ana Maria Menéndez, UN Under-Secretary-General and Senior Advisor of the UN Secretary-General on Policy. Mr. Zapatero, dubbed the “Godfather of the Alliance” by Ms. Saad for his instrumental role in launching the Alliance, made four major points. The first was that no religion or belief can serve to uphold or legitimize violence. The second point he made was that diversity, rather than being seen as a weakness or disease, should be seen as an asset. 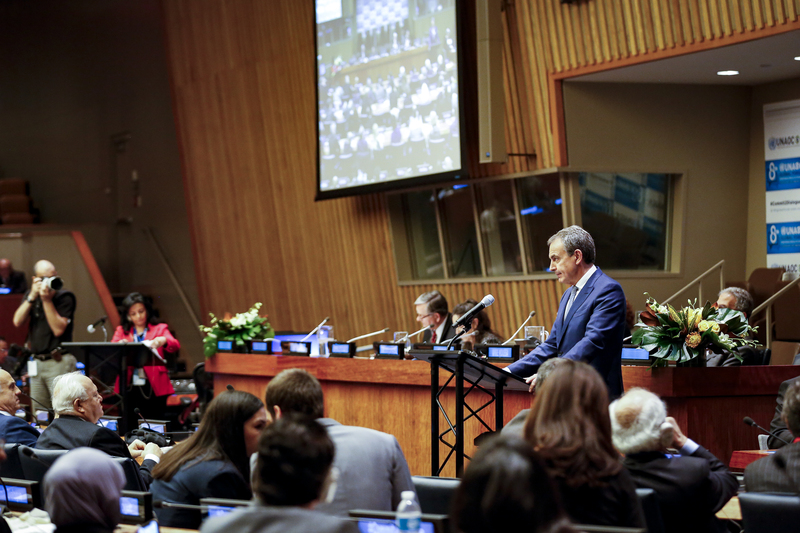 Third, Mr. Zapatero said that empathy, respect, and humility were fundamental to dialogue, coexistence, and understanding. The fourth point is his recommendation that UNAOC engages with the UN Security Council and undertake a mediation role. 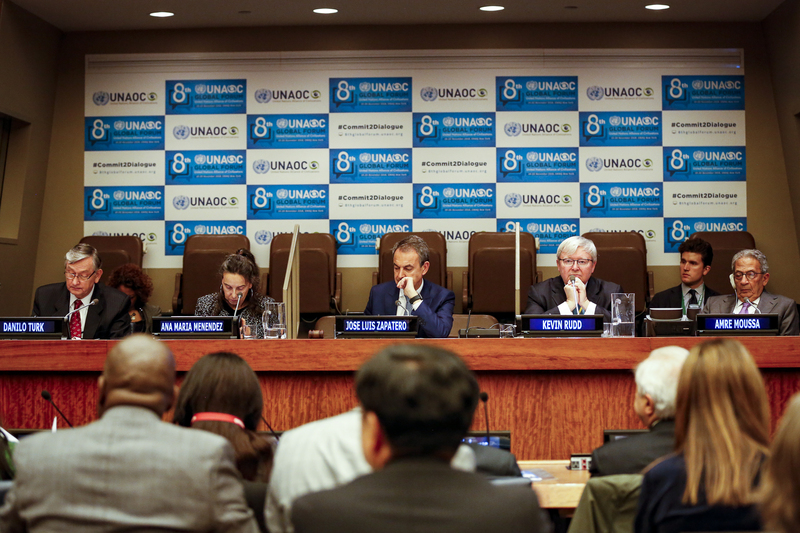 he encouraged Member States to support UNAOC financially. Mr. Türk agreed that diversity is an asset. However, he said diversity could also be problematic and needed to be managed. He laid out four principles for management towards meaningful dialogue. These were: opening up space for youth, managing crises wisely, reaching out to religious communities, and not avoiding critical questions. Pointing out how identity politics are being abused for political ends, Mr. Rudd focused on how our identities can be enhanced by how kind we are to people of other cultures. Mr. Moussa stressed the role of outreach, particularly to those who have no access to education, as a foundation for dialogue. While there may be a so-called “clash of civilizations,” he called for nations to work together to prevent clashes. Mrs. Menendez highlighted the gender dimension of peacebuilding and dialogue, pointing out that without women, there is no alliance of civilizations. She stressed that to adequately address the various and complex problems of the world required the inclusion of half of the global population – women. She noted that conflicts are complex and that resolving conflicts requires an integrated approach that involves many elements.